Consumers are not aware how much energy they use on a daily base, what their carbon footprint is and how they can easily improve and contribute to fighting climate change. With partners WWF and the Missing Chapter Foundation, we choose to focus on showering, since heating up water to take showers takes a substantial chunk of a household energy use and carbon footprint, and showering is very tangible for everyone. On average, Dutch people spend 9 minutes per shower. If everyone in the Netherlands would shower 4 minutes shorter this would save the same amount of energy as taking 763,000 cars off the road. WaterSavers uses Unilever’s ‘5 levers of change’ model to create behavioural change in energy use at home. Via an educational programme in schools and an online platform, children are provided with the information (lever 1: make it understood) and tools (lever 2: make it easy) that help them to successfully start a dialogue at home with their parents on energy use. Children can design their own shorter-shower-call-to-action label for a bottle of Andrélon shampoo or Dove body wash (lever 3: make it desirable), which end up at the place where the action is – in the shower. The kids also get a WaterSavers action booklet with playful assignments such as working with an online improvement meter and a WaterSavers stopwatch app. Next to better understand climate change and its impact, they are empowered to act themselves and to save money on their families’ energy bill (lever 4: make it rewarding). The 5-week school programme and built-in reflection moment after 6 months, provides the length necessary to make the new behaviour a habit (lever 5). To further upscale the programme, we introduced the ‘Deal of 5 billion’ – aiming to have 600,000 people before the end of 2017 to commit to shower no longer than 5 minutes, saving 5 billion litres of hot water. WaterSavers has since 2014 been rolled out to more than 700 schools and run at several big events. 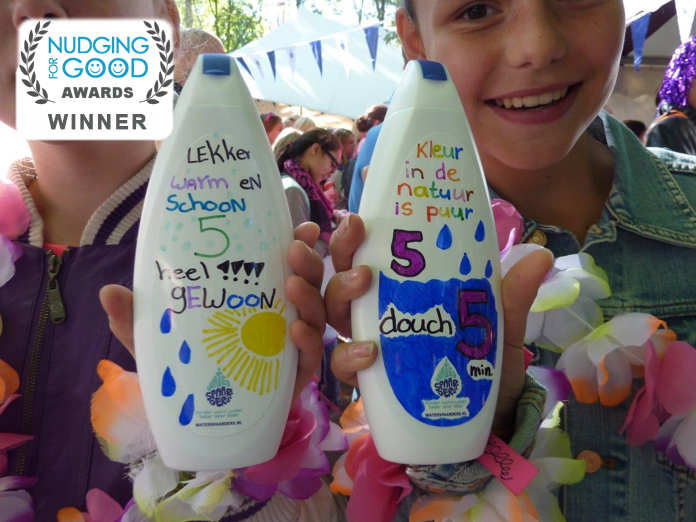 In total, over 75,000 children have designed their call-to-action label, reaching >250,000 people in the shower, and 140,000 people participate in the ‘Deal of 5 billion’. Although actual measurement of behaviour change proved to be too challenging, a survey among parents of kids who participated in the programme, showed that on average the majority of the families claimed to still shower shorter after a couple of months.